Today I pay homage to one of the greatest men to have lived and passed in the 20th Century. A man of faith, peace, virtue, courage, strength, passion and purpose. A man who dedicated his life to fighting for one of our most important causes. The non-violent activist leader of the successful civil rights movement in the USA, who was so tragically assassinated in 1968. 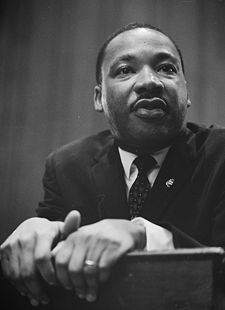 Every third Monday in January is Dr Martin Luther King Jr day (his birthday is 15th January). It is one of only 4 National holidays in the US calendar dedicated to commemorate a private citizen. He lived to teach many we are one. And died for the unity of us all. A true King amongst men. Thank you Dr Martin Luther King Jr for all that you achieved and all that you started, may we all continue to peacefully progress towards the universal humanitarian quest for racial equality, unity and justice. Love Me? Never Leave Me! GIMME THAT DIGITAL NJ LOVE! Search for a lil sumtin here!